D.N. Lukens won in the workplace category for a small company. Six New Hampshire businesses and organizations took home the top prizes Oct. 20 at NH Businesses for Social Responsibility’s second annual Sustainability Slam. The evening consisted of 12 finalists presenting their stories of sustainability to an audience at LaBelle Winery in Amherst. The audience picked the winners by casting votes through electronic polling. The finalists presenting at the Slam were given 90 seconds to share their stories in a creative format. Winners from one large and one small company were selected in each of three categories. 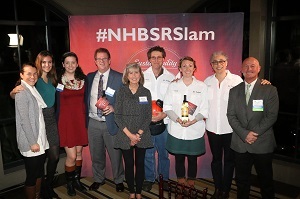 The Sustainability Slam is part of NHBSR’s Just One Thing campaign, which is designed to recognize businesses and organizations for their environmental, community and workplace initiatives, while encouraging more businesses to get involved. The campaign is based on the idea that sustainability makes sense for all New England businesses and that the path to sustainability for each of us starts with Just One Thing. “In the midst of a very divisive political environment, it’s wonderful to see businesses and organizations sharing ideas, connecting and encouraging each other’s efforts to reduce environmental impact, develop better workplaces and support our communities,” said Michelle Veasey, executive director of NHBSR, after the event. The Velcro Companies was presenting sponsor of the Sustainability Slam. Creative Director Sponsor was EVR Advertising. Media sponsors were NH Business Review, NH Public Radio, NH Public Television and Fiddlehead Magazine. Slam Award Sponsors were Coca Cola Bottling of Northern New England, Wire Belt and ReVision Energy. Networking Sponsor was Granite River Studios. Technology Sponsor was @Website Publicity. Silent Auction Sponsor was Normandeau Associates. Supporting Sponsors were Image 4, Monadnock Paper Mills and The RAM Companies. For more information about the event or to submit stories for the 2017 Sustainability Slam nhbsr.org/jot.